A group of 27 retired military leaders backed Sikh Americans’ long standing demand to be allowed to serve in the US military while keeping their turbans and beards. “The US Department of Defense has taken important steps towards recognising the importance of religious faith to the lives of our service members,” said the letter as cited by the Wall Street Journal. They were asking that the military should find a more reasonable way for Sikhs to serve without going through what they describe as a long, difficult process of getting an exemption allowing turbans and beards. In some cases, a military service branch may require a Sikh to shave his beard and remove his turban while waiting for the exemption, the Journal noted. In the 1980s, the military established regulations that required service members to adhere to uniformity rules about appearance, including hair and grooming standards that prohibited beards and headwear. However, since 2009, the military has allowed three Sikhs to serve in the US military wearing turbans. Among them major Kamaljeet Singh Kalsi, 39, was awarded the Bronze Star for his work as the medical officer running the emergency room at Camp Dwyer in Helmand province, Afghanistan, in 2011. Kalsi told the Journal, his accommodation took 15,000 petitioners, 50 congressional signatures and a year and a half “just to get one guy in” an onerous process that discourages many Sikh Americans. Meanwhile, Joe Crowley, Vice Chair of the Democratic Caucus in the US House of Representatives, welcomed the call by 27 retired US military leaders to allow Sikh Americans to serve in the military with their turban and beards. 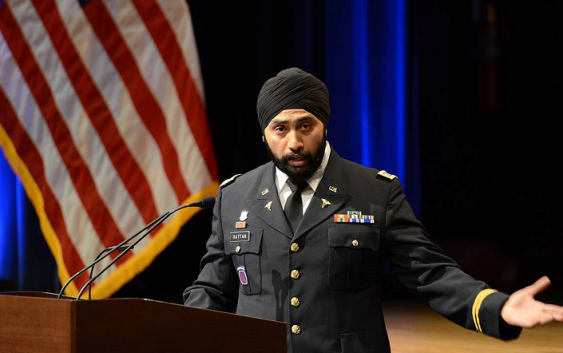 “Sikh Americans love this country and want a fair chance to serve in our nation’s military. We should embrace this wish, not place restrictions on it,” he said. Last year, Crowley and Republican House member Rodney Frelinghuysen led over 100 Members of Congress in a bipartisan letter to the Department of Defense urging the US Armed Forces to update their appearance regulations, allowing once again the Sikh Americans to serve while abiding by their articles of faith, such as wearing a turban or beard.